Whether a weight-saving or a cost-cutting measure, the flimsy plastic stylus included on most recent Palm smartphones is undoubtedly a sore spot amongst line-time Palm fans used to decently-sized metal styli. While I thought that the regression from my Palm TX to 700p to 755p was bad enough, Centro users really get the, ahem, thin end of the stick when it comes to cheap, thin, uncomfortable stock styli. Fortunately for me, I have a Treo 755p and that device's larger form factor (shared with the older Treo 680 and 750) permits a thicker, slightly more comfortable stylus as well as a wider variety of available replacement. In my opinion, the classic (2002-2005) spring-loaded "boing boing" stylus found on Palm's T|T/T2/T3 line and last seen on the LifeDrive Mobile Manager was the pinnacle of the mobile stylus. But Palm has truly insulted that fine design's legacy with their latest toothpick styli. In fact, long-time Palm OS users might easily mistake Palm's latest OEM styli as leftovers from the Sony Clie era. Prior to purchasing my 755p, I had read the horror stories about the new 680 and 750/755 Treo styli being a step back from the all-metal versions used on the Treo 700 and all prior models. But after receiving my new 755p approximately six weeks ago, I immediately ordered a 3-pack of Palm's Stylus/Pen pack just to have a few spares to keep in my desk drawer. After living with the mediocre Palm offering, I decided to bite the bullet (or, perhaps I should say "the toothpick") and ordered a Seidio pen stylus alongside a few other accessories from Seidio. Sold in a retail 3-pack. Integrated ballpoint pen but otherwise identical to the stock stylus in looks & construction. Sold online individually or in a three-pack. Integrated ballpoint pen with nice all-metal construction. This model was by far the worst of the three candidates. It's not only flimsy but it lacks any visual pizzazz or a built-in pen. 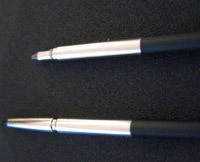 In typical Palm fashion, the stylus is thinner and flimsier than the stock styli for the previous Treo 700-series generation. But it's not just the stylus that has seen cost-cutting; Palm has taken away a number of small features on the 755p compared to my previous 700p. While the backlit space bar/d-pad and the loss of the reset button are my main gripes, the cost-cutting stylus downgrade really is not befitting of a supposed "flagship" smartphone. Of course, the absence of an integrated pen is just an extra kick in the groin from Palm. I cannot imagine it would add anything to Palm's production costs—or take anything away from their bottom line—to toss a single stylus pen combo in the box with each new Treo 750/755p. This is pretty much the exact same thing as the stock stylus, aside from the inclusion of, surprise surprise, a black ballpoint pen. I found it fairly easy to remove the tip to write. While this isn't going to replace the Cross & Lamy pens sitting here on my desk anytime soon, it's better than nothing in a pinch—and that's all that counts. Unfortunately, Palm's execution leaves something to be desired. Several times I found myself unscrewing the plastic body from the metal tip (revealing...nothing) when I was actually trying to unscrew the middle section of the metal tip to reveal the hidden ballpoint pen. With the utter lack of anywhere convenient to purchase these guys (my local BestBuy doesn't have replacement styli for the 750/755p, the closest Staples is on the other side of town, and Office Depot has canned their entire PDA/smartphone portfolio) I purchased a pack of these direct from Palm.com during their recent free shipping promotion. So, $15, no sales tax and free shipping-not a bad price at all for three mediocre pen styli but not a fantastic deal either. It's worth noting that the pack includes the Treo 750/755p bodies pre-installed with a set of three plastic modules for the similar but different Treo 680 included in the packaging. Fortunately for me, the 755p uses the exact same size stylus as the 750, even though Palm's older packaging only lists the 680 and 750 as compatible devices. Wow, what a difference a few bucks makes! This is far and away the best quality stylus for the 750/755p that I've used. The fact that it has an integrated ballpoint pen is just icing on the cake. This is basically the same exact unit as I reviewed earlier for my 700p, which in no way makes it a bad product. In fact, the positive attributes of this stylus are even more pronounced when taking into consideration the lame stylus included with the most recent Treos. Due to the rigid all-metal construction, this was both the best writing pen and the best stylus in this roundup. Also, I greatly preferred removing this one's cap to access the pen instead of having to unscrew the stylus tip. I also thought that the ballpoint pen on the Seidio wrote a bit more smoothly. The problems I noted with the 700-series version of this stylus being embedded a bit too deep in the Treo's stylus silo has been totally rectified, though I'm not sure this should be attributed to the designers at Seidio designers or at Palm. Seidio's rather steep $6.95 + shipping price tag for one stylus is a bit dear, especially taking into account their incredibly slow order processing and shipping. 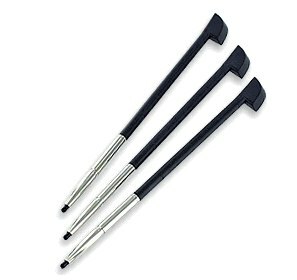 Seidio also offers a three-pack of the same stylus for $12.95 + shipping. This probably would be a much wiser investment for most users, especially if they can avoid getting burned by purchasing the Palm pen styli. I've lost more styli in my PDA-owning lifetime than I care to think about. So with the closure of all of Palm's retail stores and most retail chains abandoning their Palm handhelds and accessory inventory left and right, it's a good idea for anyone to go ahead and purchase a few spares of any type to have around "just in case". I'm glad to report that the Palm replacement pen styli are no worse than the wobbly, lightweight stock stylus. Unfortunately, they also aren't any better. I can wholeheartedly recommend anyone who still does more than a modicum of stylus input on their Treos to go ahead and treat themselves to at least one all-metal Seidio replacement stylus. I must say that I whole-heartedly agree with you about the deterioating Palm styluses. I have about 11 different Palm devices all the back to my original Palm Pilot. And after reading this article I pulled them and gazed at how Palm has just been getting cheaper and cheaper in so many different departments. Losing the reset button has been the worst thing Palm has done as far as I am concerned. But the cheapening of the stylus is a close second. IMO, unceremoniously dumping Graffiti 1, Palm's tried & true input method for 6+ years, was the worst thing they've done product-wise. But losing the reset button is right up there, as is the endless carousel of bottom connectors, styli shapes/sizes, expansion card formats and for their smartphones, battery types. I mean, in some ways the 755p is a step above the 700p (rubberized exterior coating, improved performance/stability, louder speakerphone volume, sleeker formfactor). If the device's MSRP was being noticably reduced as well, that'd be acceptable. But when you're looking at $500+ full retail price, those missing little details really start to annoy, especially when Palm is still supposedly trying to "delight the customer". "This model was by far the worst of the three candidates. It's not only flimsy but it lacks any visual pizzazz or a built-in pen. In typical Palm fashion, I found myself several times unscrewing the plastic body from the metal tip when I was actually trying to separate the metal part in the middle to reveal the ballpoint pen tip." So does it have a pen or not? Did you read the paragraph after it? "Of course, the absence of an integrated pen is just an extra kick in the groin from Palm." Heck, did you read the paragraph you quoted? "...but it lacks ... a built-in pen." 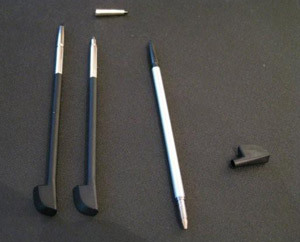 Smartphone Experts also makes pen styli. As styli, they are perfectly good. As pens, they are also perfectly good, assuming you don't need to actually put ink on paper. I could not agree more about the downgrade in stylii...the Centro plastic toothpick is a joke. Anyone know of a decent replacement? The ONLY good part about the LD was its stylus...and since that was a carryover from the earlier Tungsten T sliders, that pretty much makes the LifeDrive a total dud! The best part about the LifeDrive is it's gone. The worst part is I own one. Well this is an interesting news piece. A good litmus to how dead the palm world is. A 'stylus shoot out.' Wow. The only only other story I can remember that was more interesting was the one about the pink Centro a few weeks back. Settle-down, Martha; you know the doctor told you not to get to excited. Having read this review, I purchased the Seido pen/stylus combination. It's quite good, and admittedly flexible when used as a pen, but it accomplishes the task for which it is designed, when I don't happen to have a pen on me (and I almost always have a pen on me), at least I've got one tucked away in my stylus. After all, there's only so much tensile strength you can get the narrower the stylus barrels get.